Swansea City fought back from a goal down to beat West Brom on the final day of the Premier League season. Having secured survival a week earlier, the hosts were in relaxed mood at a relieved Liberty Stadium but fell behind in the first half as Jonny Evans nodded in from a corner. Swansea improved after the interval and equalised as Jordan Ayew headed his first goal for the club, before Fernando Llorente volleyed the winning goal with five minutes left. A fourth win in five games lifts the Swans up to 15th in the Premier League table while a ninth match without victory means West Brom finish the campaign in 10th place. Whereas the Baggies' second-half decline was symptomatic of their fading fortunes at the end of the season, Swansea's late revival was representative of their inspired run-in. This could have been a tense final day for Swansea, who had spent the season entrenched in a long and stressful battle to avoid relegation. They avoided the drop with a game to spare, a remarkable achievement for head coach Paul Clement given that the team were bottom of the Premier League when he was appointed in January. It was fitting that Swansea should celebrate survival with a match against West Brom, for whom Clement's brother Neil had played as they dramatically avoided the drop despite propping up the table at the start of the final day of the 2004-05 season. Clement was thankful his Swans side could end this campaign on a calmer note, though the former Bayern Munich assistant manager will have been frustrated by the manner in which they fell behind. Swansea had not conceded from a set-piece under Clement, until goalkeeper Kristoffer Nordfeldt failed to deal with Darren Fletcher's corner, allowing Evans to nod in unopposed at the back post. The goal rather dampened spirits at the Liberty Stadium, though the feel-good factor was restored with a fine second-half recovery. From a Gylfi Sigurdsson free-kick, Ayew nodded in from close range after Llorente had headed the ball across goal and, 13 minutes later, the provider turned scorer as Llorente volleyed in smartly from a fine cross by Luciano Narsingh. West Brom's season had followed a familiar pattern, with Tony Pulis' men racing to the hallowed 40-point mark before entering a period of steep decline towards the end of the campaign. Tuesday's defeat at Manchester City stretched their winless run to eight games, a sequence in which they had scored only three goals and picked up two points. On this occasion, however, they were glad to face a Swansea side whose minds already appeared to have turned to summer holidays having spent two nights in Ibiza less than a week before this fixture. West Brom were barely troubled defensively and, as ever, they were a threat from attacking set-pieces, and Evans' goal was the 16th time the Baggies had scored from a corner this season. That was until the second half, when they allowed their opponents to seize the initiative. The Baggies' passive end to the game - and, in truth, the season - suggested the summer break could not come soon enough for Pulis' players. Typically solid in possession and busy defensively, Britton made the crucial block on Salomon Rondon early in the second half to stop West Brom going 2-0 up. Paul Clement has won six of his nine home league games in charge of Swansea (D1 L2), with the only defeats in this run coming against Arsenal and Tottenham. Clement's win percentage of 47% is the best of any Swansea manager in the Premier League. The Swans have now won five of their six home Premier League encounters with West Brom (L1). West Brom finished 10th in the table, while only in 2012/13 (8th) have they finished higher in a Premier League campaign (also finished 10th in 2011/12). 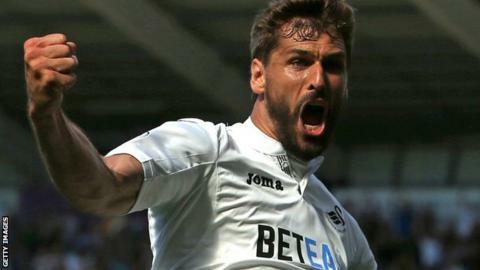 Fernando Llorente has scored 11 goals at the Liberty Stadium this term; no Swansea player has netted more there in a PL season (also Michu in 2012/13 - 11). The Spaniard scored and assisted in a league game for the first time since May 2014 (for Juventus v Cagliari). The Swans netted with both of their shots on target in this game, while their first didn't come until Jordan Ayew's 72nd minute equaliser. Swansea manager Paul Clement: "It's very satisfying to break that 40-point barrier; 29 points for the second half of the season is very, very pleasing. "I had belief in what I was doing. The players responded fantastically and it was a big team effort. "Ultimately, the objective was to keep the team in the league. For me, there were more wins than that. We created a great team spirit. I think the club is on its way back to getting its identity back. "I don't think this squad needs a big overhaul. Given the points we put on at the end of the season, I don't think we need major surgery. Next year we've got to build on from the momentum we've gathered. This squad has a lot of potential and I'm glad in the second half of the season we were able to play closer to it." West Brom manager Tony Pulis: "I'm desperately disappointed the lads have got nothing out of the game today, because they deserved it. "Their first goal is shocking defending from us. For the first hour, I thought we controlled the game. The lads have worked really hard this year. We've got punished in both [final] thirds of the pitch at the end of this season. "I'm more concerned about making clubs better, wherever you finish. We've done better than what we did the previous year." Match ends, Swansea City 2, West Bromwich Albion 1. Second Half ends, Swansea City 2, West Bromwich Albion 1. Federico Fernández (Swansea City) wins a free kick in the defensive half. Kristoffer Nordfeldt (Swansea City) wins a free kick in the defensive half. Substitution, Swansea City. Stephen Kingsley replaces Jordan Ayew. Corner, West Bromwich Albion. Conceded by Kristoffer Nordfeldt. Attempt saved. Jonny Evans (West Bromwich Albion) right footed shot from the right side of the six yard box is saved in the top right corner. Assisted by Ben Foster. Substitution, West Bromwich Albion. Jonathan Leko replaces Marc Wilson. Foul by Fernando Llorente (Swansea City). Attempt blocked. Chris Brunt (West Bromwich Albion) right footed shot from outside the box is blocked. Assisted by James McClean. Corner, Swansea City. Conceded by Claudio Yacob. Attempt blocked. Gylfi Sigurdsson (Swansea City) right footed shot from outside the box is blocked. Assisted by Ki Sung-yueng. Goal! Swansea City 2, West Bromwich Albion 1. Fernando Llorente (Swansea City) right footed shot from the centre of the box to the bottom left corner. Assisted by Luciano Narsingh with a cross. Substitution, West Bromwich Albion. Hal Robson-Kanu replaces James Morrison. Substitution, Swansea City. Ki Sung-yueng replaces Leroy Fer. Substitution, West Bromwich Albion. James McClean replaces Jake Livermore. Attempt missed. Jordan Ayew (Swansea City) right footed shot from the left side of the box is close, but misses to the left. Assisted by Martin Olsson. Corner, West Bromwich Albion. Conceded by Martin Olsson. Goal! Swansea City 1, West Bromwich Albion 1. Jordan Ayew (Swansea City) header from very close range to the centre of the goal. Assisted by Fernando Llorente with a headed pass following a set piece situation. Substitution, Swansea City. Luciano Narsingh replaces Leon Britton. Attempt missed. Alfie Mawson (Swansea City) header from the centre of the box misses to the right. Assisted by Gylfi Sigurdsson with a cross. Attempt missed. Jake Livermore (West Bromwich Albion) right footed shot from the right side of the box is too high. Assisted by James Morrison.